Let’s talk whole grains. If you’ve been paying any attention at all to the food experts in the last, oh, twenty years, you know that you’re supposed to be eating whole grains for your best health. And in general, I’m completely on board with this advice: I love a good wheat bread, and my mouth starts watering at the mere mention of a wheatberry salad or some slow-simmered pearl barley. The problem, though, is time. 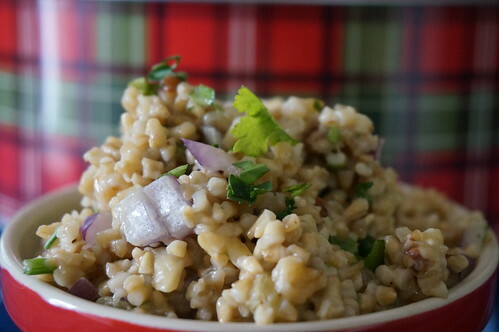 That slow-simmered barley, that wheatberry salad? Yeah, once you decide to go that route, you’re looking at an hour of simmering, easy. And that’s all well and good for a long winter weekend, but when you’re pressed for time, and especially when you’re pressed for time and the weather’s finally turning warm, the last thing I want to do is set a big, heavy pot on the stove for hours and hours. So instead I eat a LOT of white rice. And there’s nothing wrong with that, really: white rice is delicious and adaptable, if a little lacking in the bran-and-complex-nutrients department. Sometimes, though, you want to switch it up a bit, but you still want a nice toothy bite of grain. Enter the steel-cut oat. I know this might sound crazy, since the most common steel-cut oat recipes have you simmering for hours, even overnight in a crockpot. But that’s for a creamy porridge — for a grain salad, with separate individuals morsels, those oats only need to be simmered ten minutes, tops. And if you cook the oats in rich, savory stock? 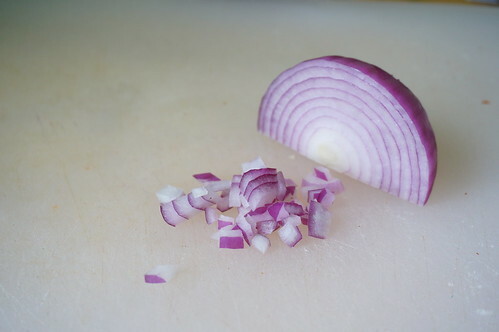 And then if you fold in some bright, sharp red onion and green parsley? And maybe some soft, sweet raisins? Oh, brother. Then you’ve got a salad that not only plays a strong supporting role on your dinner plate, but can even take a starring role for your lunch. 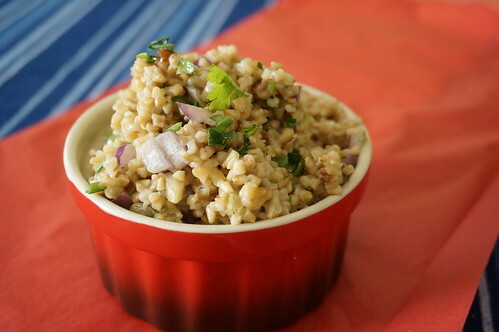 This salad’s a great way to get some delicious whole grains in your diet without taking hours of stovetop time. It would be a great side dish with a protein and/or a vegetable dish, but I’ve been eating it nonstop in combination with other room temp salads: it’s a perfect brown-bag companion. Combine oats and stock (and tsp salt if stock is unsalted) in small saucepan. Bring to a boil, then reduce heat and simmer without stirring until liquid is almost all absorbed, 7-10 minutes. Transfer to heatproof bowl and fluff with a fork, then let sit covered at least ten minutes. Meanwhile, heat orange juice on stove or in microwave until hot but not boiling. Add raisins and let sit until oats are ready. Strain raisins, reserving juice. 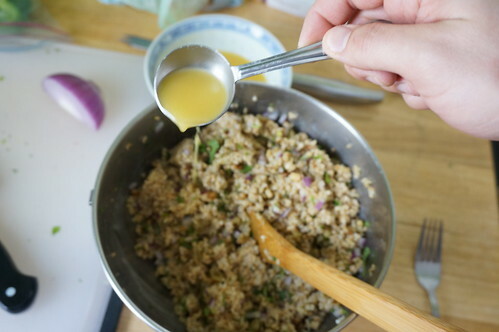 Add the strained raisins to the oats along with the walnuts, onion, and parsley. Add in enough reserved orange juice to moisten, about 6 Tbsp. Season with salt and pepper to taste and serve warm or room temperature. Whoa nelly: so many options. Yes, red raisins would also work nicely here, as would most other dried fruits. You want to switch out the nuts, or drop them entirely? Have at. (Though I do like the touch of protein they add to this salad.) You could even swap to a different grain — brown rice, wheatberries, quinoa, all sound good to me — though you’ll need to treat each differently in the preparation.